The CRISPR-Cas9 has been called the medical break through of the century. 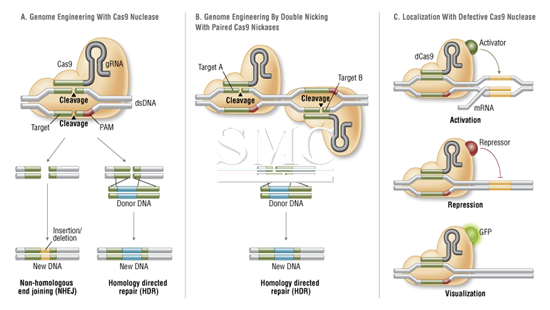 The CRISPR-Cas9 is a genome editing tool that has a wide variety of applications in the medical world. The CRISPR-Cas9 is cheaper and more accurate than previous DNA editing devices. The CRISPR-Cas9 uses its gene- editing precision to treat a multitude of serious diseases and illnesses such as certain types of cancers. Scientists and doctors alike are looking to use this same technology to treat patients more minor conditions like sickle-cell, hepatitis-B, and even high cholesterol. The CRISPR-Cas9 is currently in the trial stages of development. The current trial in operation is testing the effectiveness of the CRISPR-Cas9 system in treating three types of tumors: melanoma, sarcoma, and myeloma. If these trials prove successful this could be the largest advancement in history in finding the cure for cancer. The CRISPR-Cas9 uses science based on the functions bacterial palindromic repeats. Bacterial palindromic repeats were discovered in 1980; however, scientists could not decipher their function and potential capabilities. The first steps in the CRISPR-Cas9 systems process is the extraction of certain immunity cells known as T-cells. The CRPISPR-Cas9 system will use two key modules to mutate these cells. The first module is called Cas9. This acts as a pair of “molecular scissors” that cut the two strands of DNA at a specific location in order add or remove a segment. The second key module is a piece of RNA. This is a small portion of pre-designed RNA located in a larger segment. This is responsible for guiding the Cas9 to the intended part of the genome. A new gene will then be added to these extracted T-cells designed to bind to a protein found in many types of tumors. Once the T-cells have banded with this receptor the T-cells will seek out and destroy the tumor cells. In the US, the federal committee has given its approval to begin the CRISPR-Cas9 trials. The first patients have been injected with their own edited DNA. However, the CRISPR-Cas9 trials do pose some risks. The CRISPR-Cas9 works by cutting some DNA and it is possible that the DNA is cut in the wrong place. The concern with this is that the new T-cell could actually introduce cancer causing mutations into a patient. Whether or not the CRISPR-Cas9 trials will be successful is unknown, but scientist and doctors worldwide are hopeful.